Added to mash water to increase hardness. 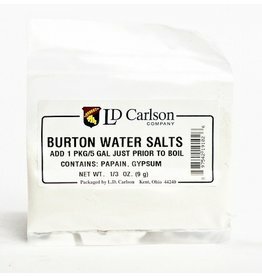 Magnesium Sulfate is one component of the famed Burton-On-Trent brewing water. Lowers acidity in wine. Use 1/2 teaspoon per gallon to lower acidity 0.1%. Raises mash pH in beer. Used commonly in dark beers. Lowers pH. Useful for adding Calcium if the water is low in chlorides. Commonly used in beers with malt forward profile. Contains potassium metabisulphite and is a convenient way to accurately sulphite wine. Each tablet contains 450 mg of active sulphite per tablet. Two crushed tablets equal 1/4 teaspoon. Potassium Campden Tablets 100 Ct.